This article originally appeared in The Path of Orthodoxy – Winter 2015 Edition. The Path of Orthodoxy is a quarterly publication. Issues are available in PDF format at www.serborth.org. Like many large cities in the early 1900’s, Gary, Indiana, was a melting pot of ethnic groups. Serbs, Croats, Slovaks, Poles, Greeks and others flocked to the Steel City in search of work in their newly-adopted land. Amongst the Serbs was a group of immigrants mainly from Hercegovina. They owned taverns, neighborhood grocery stores, and boarding-houses; and they worked side by side in the great steel mills of Gary to make a better life for themselves and their families. They didn’t have much, but they wanted one thing more – a Serbian Orthodox Church. Men like Dushan Chelovich, Mato Chuk, Mitchel Duchich, Luka Grkovich, Jovo Marich, Tanasije Nastich and Stevo Orlich began the long and arduous process of collecting money from their fellow Serbs in order to build St. Sava Church. This year – 100 years later – the fruits of their labors are realized. Pastor Jerry Protho, a kind and loving man, opened the doors of our former church to our members who came to visit during the celebratory weekend. Another church was erected in 1938 at 13th and Connecticut. This is the church for which the famous Serb, Nikola Tesla was Kum. While he could not attend personally, Mitchell Duchich stood in for Tesla. Tragically this church burned to the ground in 1978. After several years of liturgies in the small hall that served as a chapel on 49th Avenue, a new and magnificent church was erected and consecrated in Merrillville in 1991. “Srpska Gera” once again was the beautiful church about which those early pioneers dreamed. 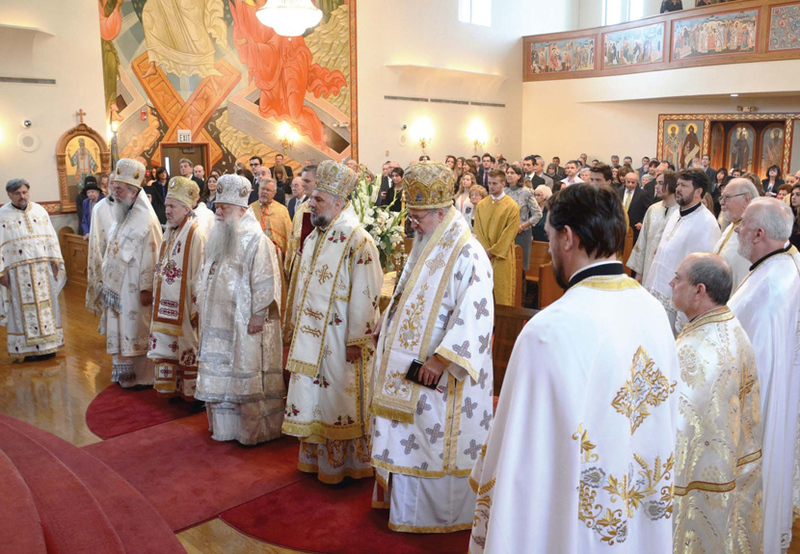 On Sunday the Holy Hierarchical Liturgy was served by His Grace Longin, Bishop of New Gracanica and Midwestern Diocese; His Grace Mitrophan, Bishop of the Eastern American Diocese; His Grace Grigorije, Bishop of Hercegovina; His Grace Sava, Retired Bishop of Slavonija; His Grace Peter, Bishop of the Russian Orthodox Church outside Russia; Archimandrite Tom Kazich of New Gracanica (Gary born and St. Sava raised); Very Rev. Stavrophor Dusan Bunjevic; Very Rev. Stavrophor Velimir Petakovich; Very Rev. Stavrophor Jovan Todorovich; Very Rev. Stavrophor Bogdan Zlajic; Very Rev. Stavrophor Luka Lukic; Very Rev. Stavrophor Ilija Balach; Very Rev. Alex Novakovich; Very Rev. Mijoljub Matic; Rev. Miroslav Obretkovic; and Rev. Sasa Petrovich. Deacons serving were Protodeacon Fr. Milovan Gogic; Deacon Fr. Vladimir Rumenic; and the Protodjakon Aleksandar Kichakov, as well as host priest Very Rev. Marko Matic. The service was glorious – the magnificent voices of the clergy singing “Axios” at the elevation to Protopresbyter of Fr. Matic and Fr. Novakovich was both thrilling and spine-tingling. One of the many highlights during the liturgy occurred when St. Sava Church was awarded “The Order of St. Sava,” an award of the Holy Synod over which His Holiness Patriarch Irinej presides. The award was presented to President Mike Ajder by His Grace Bishop Longin. The Order was accepted on behalf of the entire congregation, both living and deceased. The anniversary banquet was hosted in the pavilion filled to capacity. Approximately 900 people joined us for the afternoon. The program included brief speeches by former presidents Svilar, Erceg and Orlich and each was awarded a commemorative plaque for their services to the church. There was also a presentation to the members of the building committee in recognition for their work under tight deadlines to get the pavilion finished on time. There were greetings and congratulations from President Obama, Congressman Peter Visclosky (who was in attendance), Serbian Consul Dejan Radulovic, and Fr. Lazar Kostur. Each of the past priests in attendance shared their many experiences and memories of St. Sava from years gone by. Many years to all St. Sava parishioners and to all founders and benefactors, donors and deceased clergy who served this parish, may God grant memory eternal.